This magnificent five-bedroom villa on the northern coast of the beautiful Thai island of Koh Samui enjoys modern facilities, a stunning private pool and offers the best seat in the house for the world-famous Thai sunsets. The main cosy living room sits perfectly sandwiched between the shimmering pool on the beach-side and beautiful pond on the entrance-side, so you can kick back on the many sofas and enjoy the gentle sounds of trickling water and waves softly breaking. Overlooking the beach is a long dining table for ten, while in the adjoining room is a magnificent round table, so whether you want to dine with a cool sea breeze and sunset view or an entire class and elegance, just let our staff know, and they'll set up accordingly. The third room in this row of three alongside the pool is a merely large kitchen, with everything you could need to prepare a light snack, a banquet, and anything in between! Don't forget though; a delicious breakfast is included, as is our highly accomplished chef – so if cooking's not your thing, allow us to prepare the banquet, while you put your feet up! The master bedroom and a second double bedroom, both with king-size beds, line one side of the glorious pool, while the two twin rooms are either side of the pond in the entrance courtyard, and a third double room enjoys a slightly more secluded location away from the rest of the rooms, perfect for those seeking a little more privacy. Each room is delightfully decorated with beautiful teak desks, drawers and wardrobes, and plush cushioned sofas, set against soothing tones and soft lighting. Four of the rooms have radiant private ensuite bathrooms with huge walk-in showers, while the master bedroom enjoys a thoroughly romantic bathtub for two. The garden features a growing array of all kinds of beautiful and exotic plants, creating a natural haven just metres from the water's edge. Soft sun loungers by the pool offer a shaded spot to relax in the tropical heat, in between refreshing dips in the pool! And just a couple of steps and a rustic wooden gate stand between you and the feeling of soft sand between your toes! 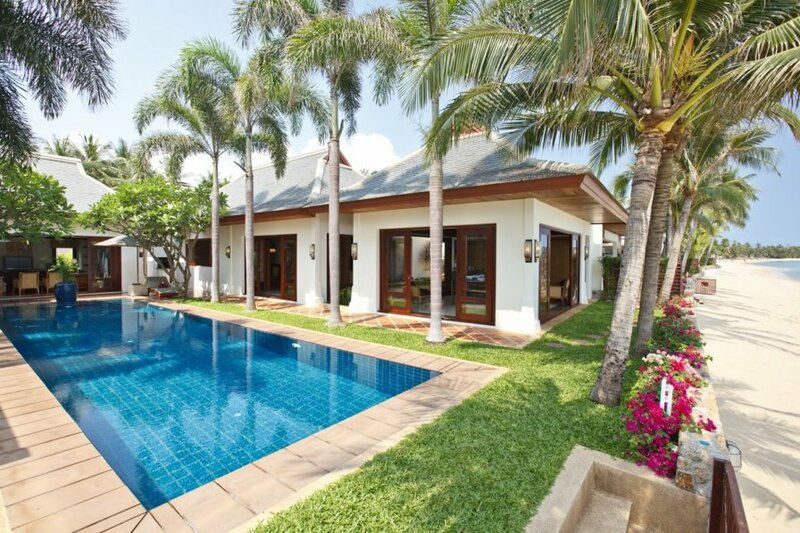 Villa Samui is located on the tranquil Mae Nam beach, a five-kilometre stretch of palm-lined, pristine white sand famous for its glorious sunsets.